Happy new year everyone ! Hope the new year ushers joy and peace to everyone. I am making new yr resolutions as usual (knowing that I am anyway going to break them -- Btw, one of which is to be regular in blogging and blog better !) . 2005 was a significant year for me on the professional front -- completing my MBA, Landing up a Consulting Job . 2006 promises a lot of action on the personal front and letz see how it unwinds. The new year day is so full of promise and optimism . I donno how it all gets lost as the days start rolling. Treat every day as a new year day and the world is yours . I know its easier said than done. But , at least I will give it a try. So are you a Chennaiite ( Btw, Is Madrasi derogatory ? ) who travels often to Tirupathi temple ? In a few years you might not have to. PTI (via Rediff) reports that, " Construction of a Rs 100 crore Lord Balaji temple in Chennai, similar to the Lord Venkateswara temple at Tirumala near Tirupati, is likely to commence in 2006.The land identification process was on. "We were shown four or five places in the city. But our Agama and Vaasthu experts have not approved these. However, the land will soon be identified and construction work is likely to commence in 2006", he said. He added that once approved, the TTD will spend up to Rs 100 crore for the construction of the temple. "The TTD board is keen to have a Balaji temple in Chennai as nearly two-thirds of devotees who come for darshan at Tirumala, are from Tamil Nadu," he said. I switched on my notebook PC. Nothing happened. Sensing trouble , I ran the BIOS test . It said "Hard Disk failure" and ever since that its been a nightmare. My warranty just expired and HP support tells me that most likely my Hard disk has conked off. All my data is lost - my MBA files,photos,emails,address books,music. I have no backup. Its utterly stupid that someone who spent years working on Backup & storage has no backup for his own data. Long live stupidity - at least it has spawned an industry of data recovery whose costs might exceed the residual value of my laptop. My virtual house is burnt now . Ah its a pain to build it again from scratch . Thank god at least I have my office notebook PC to connect to internet. thatz about 2 minutes of outpour of anger,frustration. Amen . BusinessWeek has a short write-up on the Muhammad Yunus -- the microcredit missionary. What the poor need is not charity but trust & support is the premise of the revolution Mr.Yunus has spawned through his Grameen initiative. BW reports , " As a young economics professor at Chittagong University in Bangladesh in 1976, Muhammad Yunus lent $27 out of his own pocket to a group of poor craftsmen in the nearby town of Jobra. To boost the impact of that small sum, Yunus volunteered to serve as guarantor on a larger loan from a traditional bank, kindling the idea for a village-based enterprise called the Grameen Project. It never occurred to the professor that his gesture would inspire a whole category of lending and propel him to the top of a powerful financial institution. Today, Yunus runs Bangladesh's Grameen Bank, a leading advocate for the world's poor that has lent more than $5.1 billion to 5.3 million people. The bank is built on Yunus' conviction that poor people can be both reliable borrowers and avid entrepreneurs. It even includes a project called Struggling Members Program that serves 55,000 beggars. Under Yunus, Grameen has spread the idea of microcredit throughout Bangladesh, Southern Asia, and the rest of the developing world. When Yunus started Grameen, he wanted to turn traditional banking on its head. One of his first moves was to focus on women because they are most likely to think of the family's needs. This was a radical step in a traditional Muslim society, and it took Yunus six years to reach his initial goal of a 50-50 gender distribution among borrowers. Today, 96% of Grameen's borrowers are women. "If banks made large loans, he made small loans. If banks required paperwork, his loans were for the illiterate. Whatever banks did, he did the opposite," marvels Sam Daley-Harris, director of the Microcredit Summit Campaign. "He's a genius." I shall be flying to chennai next month end (Jan end) . As always, its unbelievable what a little competition can do to prices. The Chennai - Singapore sector which has traditionally been a "high price" sector has seen prices tumbling ever since the private airlines started flying. Now, Air India (AI) & Indian Airlines (Btw, learnt that Indian Airlines has dropped the word Airlines and is now called just "Indian" ) offer great prices (S$565 for a round trip while Jet is a shade expensive at $600). Any suggestions on which Airlines (AI or IA) to fly ? For now I have blocked tickets with IA. Also, Do let me know if there are some other good deals in the offing between Singapore - Chennai ? Airtel in partnership with NDTV is Running a "Indian of the Year" contest. Participants can vote for their favourite candidate via SMS. The nominees are : Rahul Dravid, Sania Mirza, Amitabh Bachchan,Aishwarya Rai, Sonia Gandhi,Manmohan Singh,L K Advani,Nitish Kumar,Narayana Murthy,S. Manjunath,Aruna Roy,Laxmi Mittal,Sachin Tendulkar. I am glad to see Manjunath's name among the nominees. Let integrity be rewarded at least posthumously. To find out who is chosen as the "Indian of the Year", Watch NDTV 24X7 and NDTV Profit on December 31, 2005. While we can debate endlessly whether Bill is a modern day robinhood , there is no doubt about the great charity work being done by Bill & Melinda Gates foundation. This could be the ultimate dream come true for any movie buff. Since last Friday , my office building has added 4 new cinema halls which would play Indian movies (My guess is mostly Hindi/Tamil). So to catch a movie , all I need to do is take the Elevator ! The entire Indian Junta in the office is excited as if the yearly bonuses have been given ! P.S : Saw Bluffmaster (*ing Abhishek Bachhan,Ritesh,Nana Patekar,Priyanka) over the weekend. Nice TP movie. Ganguly -- A victim of Politics ? I am no fan of Sourav Ganguly but the way he has been axed from the team is not proper. The real reasons for the dropping might never be known but the most popular theory is the Sharad Pawar - Dalmiya Politics ( Of course the other theory is that he is an outsider in the team now after having openly fought with the coach and the team might stand behind the new captain - Dravid). Whatever is the reason , let us learn to treat our heroes well . Children have this knack of asking simple unanswerable questions. I was at my uncle's house last weekend and was watching the India - Sri Lanka match with my seven year old cousin. He has recently developed a keen interest in cricket and like most kids of his age has a barrage of questions. Cousin : How do they select the captain of the team ? Me : The best player in the team gets selected to be the captain. Cousin : So is Rahul Dravid the best player in the Indian team ? Me : Yeah, you could say that. Cousin : Then, was Saurav Ganguly the best player in the team before ? Its been a year now since M.S.Subbulakshmi -- the queen of Carnatic music , passed away. The " Venkatesa suprabatham" continues to be played as always across millions of south indian homes. Artistes know no death. Her music will continue to live on forever and delight hearts across the world. Albert Einstein said this about Mahatma Gandhi , " Generations to come will scarce believe that such a one as this walked the earth in flesh and blood " . These words could have been easily said about MS too. Rediff pays a nice tribute to her. To say that Bill Watterson (The creator of the comic strip " Calvin & Hobbes) is a genius , would be to state the obvious. I should thank my aunt for introducing me to the world of calvin & hobbes and for also gifting me this book on my birthday ( B'day was 3 months before , pls don't wish me now !). The world of comics & animation has always interested me. Call it a childish interest beneath an adult veneer or the ability to see the world through the eyes of kids. There is some Calvin inside everyone of us and his witty remarks and cynicism is something that I definitely possess. The amazing thing about "Calvin & Hobbes" is that its not just humorous but deeply philosophical and satirical on a different plane. I particularly enjoy the one-on-one between Calvin & Hobbes and Hobbes' teasing of Calvin. This book also features the author's mind. Watterson explains his thought process behind some of the best comic episodes and his views on Syndication,commercialization and abrupt ending of the strip almost a decade ago. If you are a Calvin & Hobbes Fan , this book is a must buy. If you haven't read the comic strip yet, Please do. Its perhaps one of the best reading decisions you could make. They are so different yet so similar. At a conference organised by IndUS Entrepreneurs and moderated by Prannoy Roy , both Bill Gates and Narayanamurthy opened up and looked back on their journey. Gates' biggest dream - to merge US with India & China to create a great country ! This is a nice read. Wonder if it was telecast on NDTV ? Must the UN stay in Manhattan ? This opinion piece in International Herald Tribune caught my eye. Is it necessary for a cash-strapped organization whose mandate is to preserve world peace and fight poverty to occupy one of the most expensive pieces of real estate in one of the world's most costly cities? Having worked with NGO's before , I have seen from close how most of them strive to keep their overheads (costs) very low so that the majority of the donor's money go to the help the cause .Shouldn't the UN be following the same ? Are you a Batsman or a bowler ? This innocent question left me perplexed and searching for an answer (Though I ventured with a brave "Batsman" answer). At my workplace , we decided to play cricket on the weekends for fun but with all seriousness. The Ceylon Sports club nets was booked for every weekend and Bats,cricket balls,Pads,gloves,helmets arrived from our India office ( I told them I have not even worn helmets in two wheeler much before ! ) . The last 3 saturdays (8am-11am) has been spent toiling on the cricket grounds. The first weekend was a disaster . Most of my balls were either short pitches or full-tosses or wides though I batted quite decently. Now on the third week , I seem to have finally found my calling -- Leg spin (yeah the ball actually spins !). I am getting the line finally right (in fact the ball suddenly spun the other way and everyone thought I had bowled a googly !) and the batting seems to be getting better. Good to play some serious sport after a loooong time ! The office team is a international mix -- Indians (70%),Pakistanis,Sinhalese,Singaporeans (Admire them for being a sport and turning up),Australians. Btw, If you are a firm based in Singapore and want to play us for a "sporting"match , drop me a comment ! I waited for it for so long.My first purchase after an MBA had to be an mp3 player.Was initially planning to buy an iPod but later due to budget constraints decided to take the "value for money" route. 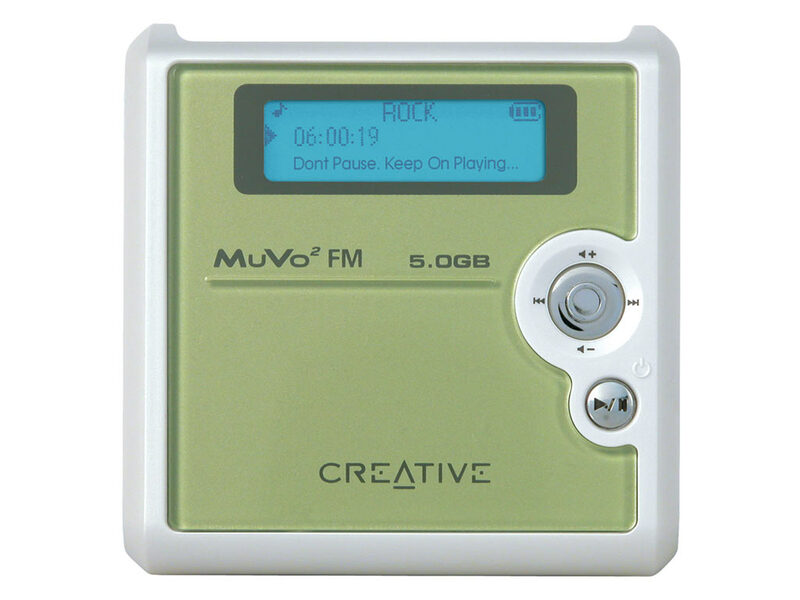 Creative muvo2 FM suited my needs and budget. 5GB space,FM,Headset,Battery charger .